To ensure delivery of Pier 1 emails to your inbox, simply add pier1@news.pier1.com to your address book. 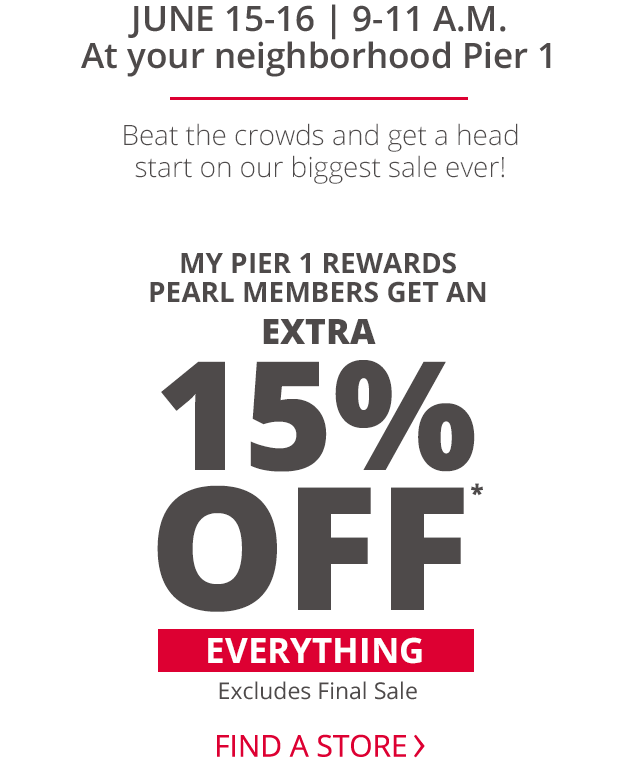 *Save 15% on your entire My Pier1 Rewards Pearl membership purchase at a U.S. Pier1Imports store Offer valid for regular-priced, sale and clearance merchandise; excludes final-sale merchandise. Subject to credit approval. Offer cannot be used for online purchases and does not apply to the following: Taxes, home delivery and shipping charges, service charges, price adjustments on prior purchases, or purchases of Gift Cards, UNICEF merchandise, or any other non-discountable merchandise. Offer is not valid in combination with any other BOGO, coupon, offer or discount and is not valid at store closing sales. No cash value. The My Pier1 Rewards credit card is issued by Comenity Bank. See pier1.com/Rewards for details. Bring this offer to a U.S. Pier1Imports store. Store associate will enter offer #1860 at checkout. Offer valid 9-11 am local time on June 15 & 16, 2018. This email is intended for customers residing in the United States. *Pricing, promotions and availability may vary by store location and online. Exclusions may apply. Magnolia Home and Poo-Pourri brands and P1Value are excluded from promotional pricing. Advertised prices are subject to change and are subject to state, provincial, and local taxes and fees. Delivery of certain items to the contiguous U.S. only. You received this message because you have opted in for Pier 1 Imports marketing emails. If you do not wish to receive emails from us, you may unsubscribe here. For questions, visit our help section online. We are not able to respond to replies from this email. Copyright 2018 by Pier 1 Imports | 100 Pier 1 Place | Fort Worth, Texas 76102. All rights reserved.